Don't worry about the relay rod bushing. The taper of the bolt will seat before it the bushing hits the pitman arm. 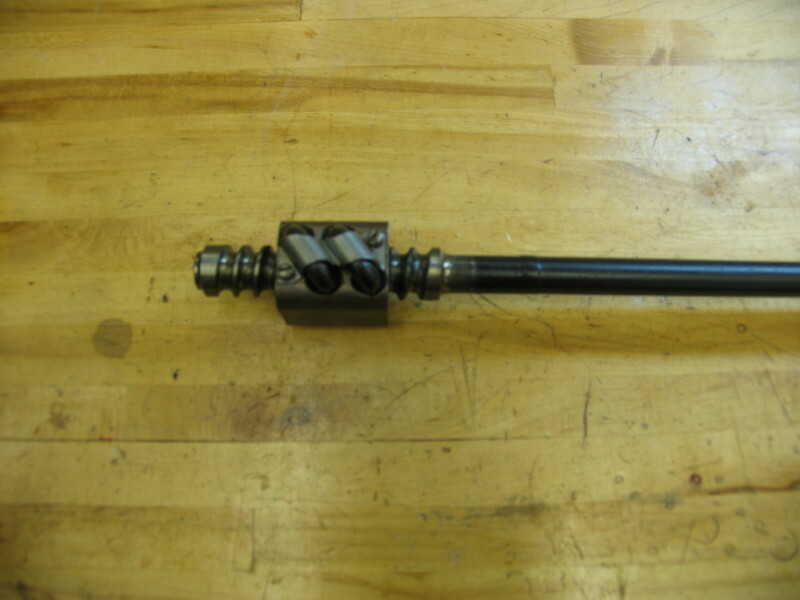 Sometimes the idler arm has a 3/16" thick black foam washer that goes between the arm and the relay rod. Basically it's just there to keep crud out. I don't think I've ever seen one on a pitman arm but there's not much reason not to use one if you have one or want to cut one out. Look at this picture. You might have to scroll upwards. If you zoom in (Ctrl and the plus key together) you can see that the top is the flat side. 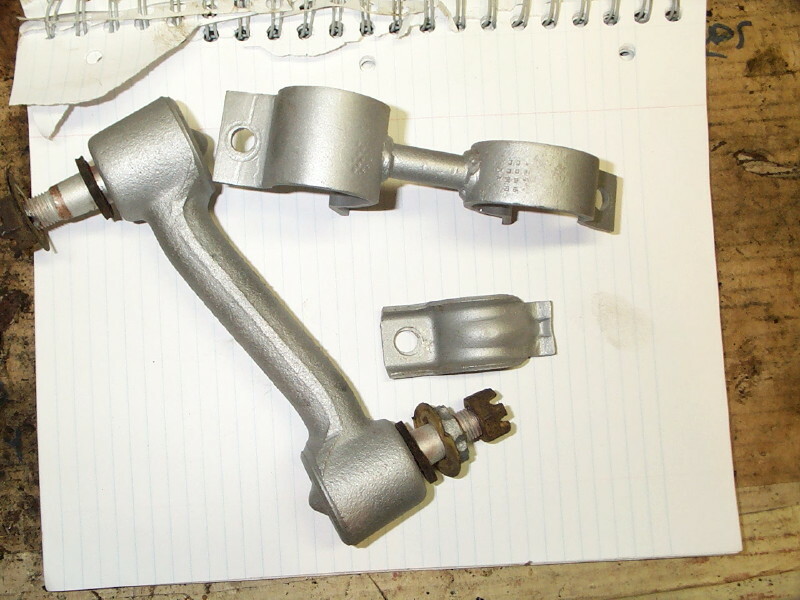 63 was the last year for aluminum steering boxes. The 64 box is the only one with the one piece worm shaft/steering shaft. The reason the box has no rust is the cast boxes were covered with Cosmoline from the factory. Once in service, the bushings and seals wore and they leaked their lube out over the box. So it's common to find little or no rust on them. Thanks much. 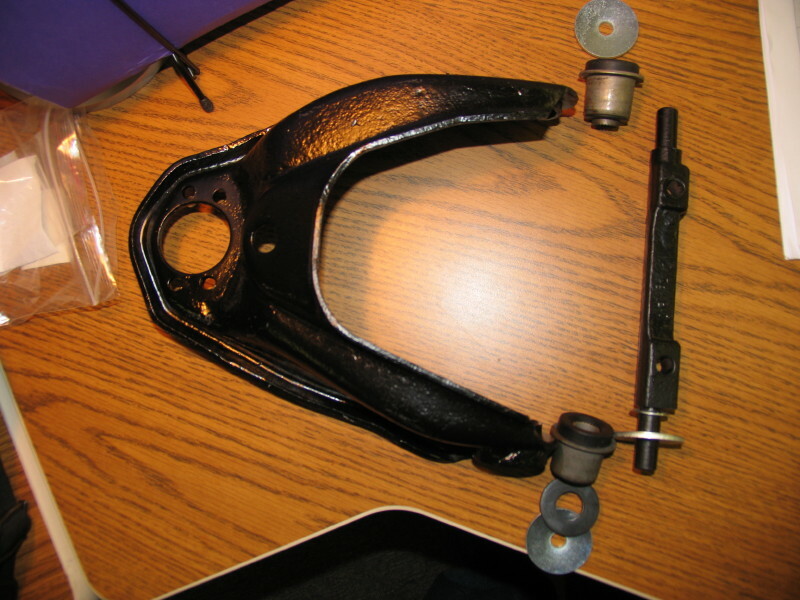 I will be putting new foam washers on the idler arm, so will add an extra for the Pitman. Photo is very helpful and is now saved in my files. I think I will paint my box with Cast Blast just to give the black suspension some contrast. "If it's not broken, you're not driving it hard enough"
Thank you for this thread. It's really appreciated. As you are aware, there is little info out there (including the books) about the finer details of the front suspension assembly. 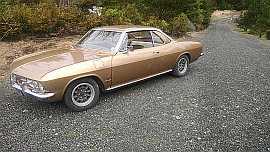 I'm in the middle of the same project (front suspension rebuild) on a '65 coupe. I'm using all new bushings, and many other new parts. I've POR-15 everything and in the process of assembling it all back together. I've hit a wall trying to torque the bolts for the upper a-arm. --- The bolts with large washers that go through the bushings and into the ends of the control arm shaft. Basically, if I even start to tighten the bolts, the washer applies pressure to the rubber of the bushing. At that point, when the upper control arm moves up and down (as it would while driving over bumps), those same end bolts are rotated loose from the end of the shaft. I don't want to steal your thread, so I'm going to take some pictures tonight and post in a new thread. If you encounter this same problem, I'd be very interested in finding out how you resolve it. I have some ideas, but I'll save the long story for a new thread. You are welcome, I am learning much from it too. I put it up here for the benefit of all us "learners" and to payback all that I have gained, hoping others will benefit. 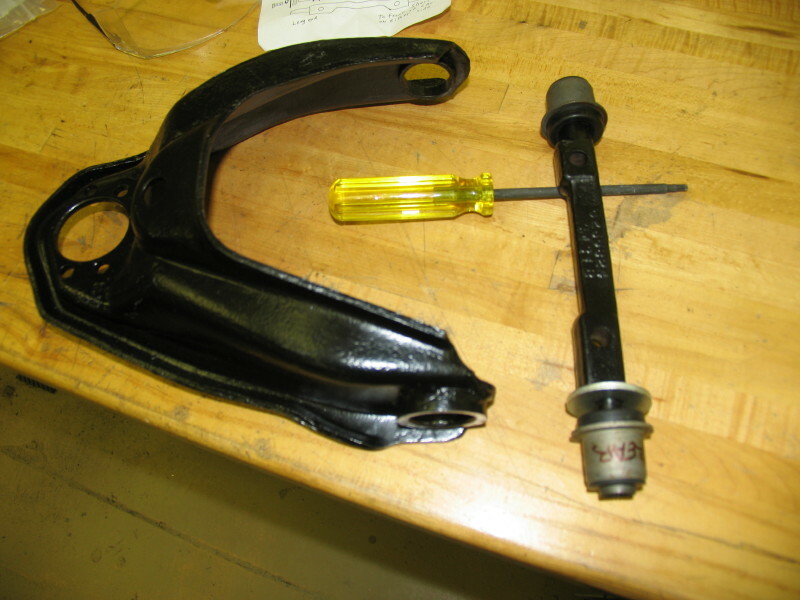 I think some have said that you do not torque those bolts until you put weight onthe suspension, but can't swear to it. I'll look for your post. Post pictures, we all love that. Great work. It's so nice to see that attention to detail and that someone else will have a new thread to expand on this area of rebuilding. Got the lower BJs pressed back in and cut one full coil off the front springs. Ground the bottoms flat to help them fit in the pocket. My ride height was 3/4 higher in front and I hope this will bring me about level. 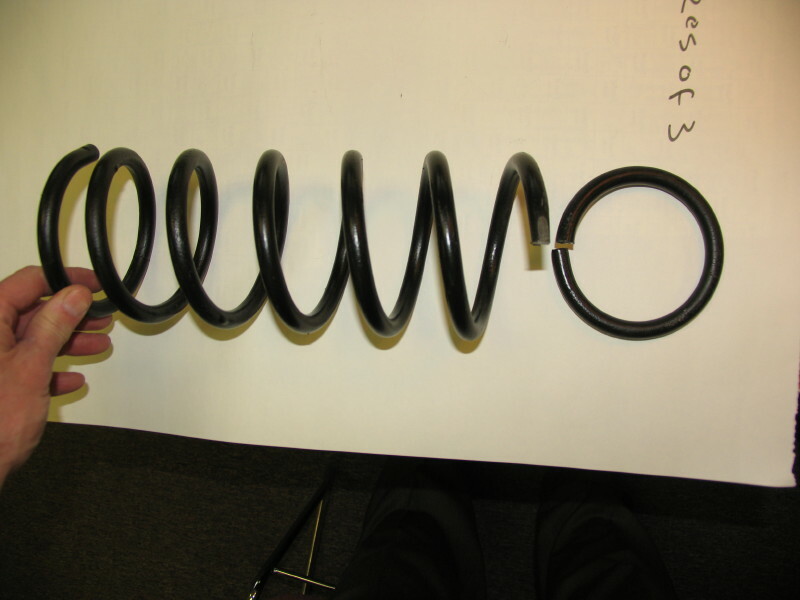 With no load on the spring, one coil makes the springs 7/8 shorter than they were before the cut, so it might be slightly lower at the nose. Can't imagine it will be very noticeable, but we will see. I'll post some photos once the suspension is back in and I have driven it around some to settle the springs. I may eventually replace the rear springs too, although I don't think there is any easy way to tell if they are bad. Welding in trunk bottom and patching other rust areas is almost complete. Parts are arriving today and I should get a chance to begin assembling the suspension and steering this weekend. One question: I did not pay attention to orientation when I took the idler arm off. Does it have a top and bottom, or does it make no difference which end goes into the center link and which goes into the bracket on the body? Mine is in the photo below. Looks like it will go either way. I promise I will post photos of the reassembly. Ratt643 answered. It makes no difference which way it goes in. Came in early and spent some time in the shop. Lower arm bushings are pressed in. 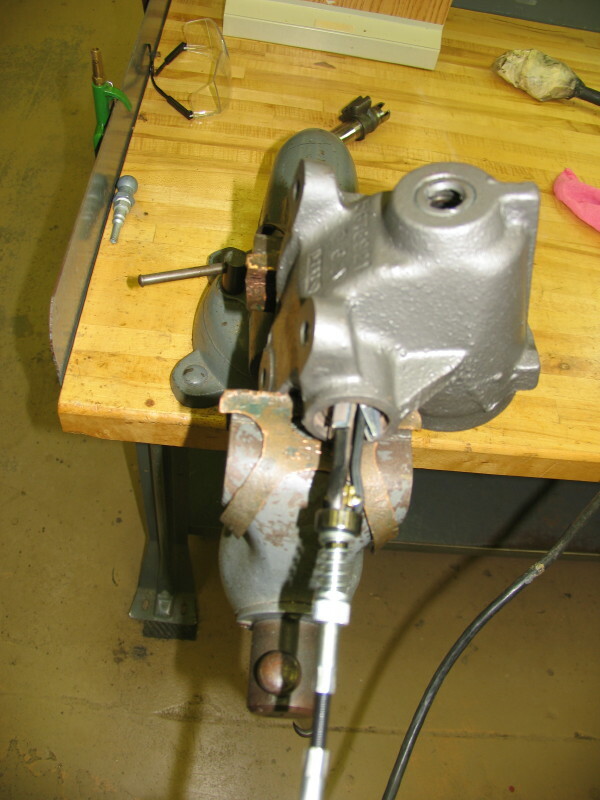 New bushings are pressed into the steering box. I will have to hone the longer one, but the pitman shaft fits into the smaller one (in the cover) perfectly. With Jerry's article and advice here, the steering box rebuild turns out to be much easier than I expected. Over lunch I will press the bushings into the A arms. WARNING! 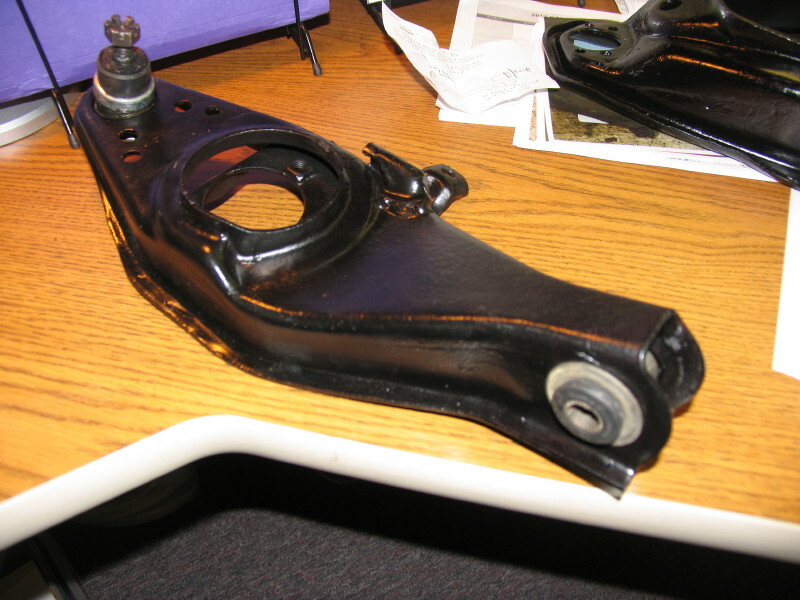 Do not put the A arm bushings in as they are shown in the photo in the above post. I had them backwards when I took that shot. Correct orientation is in the photo below. 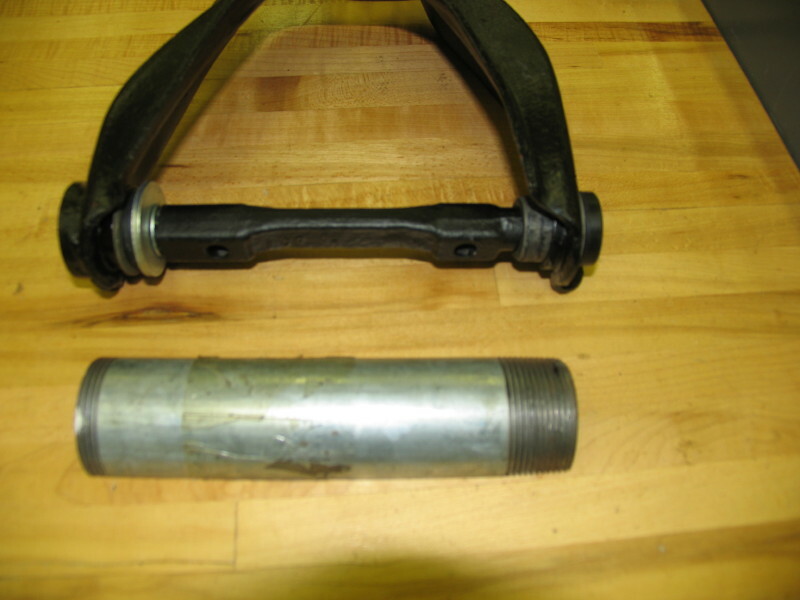 The bushing that has the inner sleeve sticking out about 1/8" from the end of the bushing goes on the rear of the arm. That part of the bushing that is then sticking out ends up with the rubber washer on it. It is correct in the photo below. Moderator: Feel free to yank that photo above if you can. 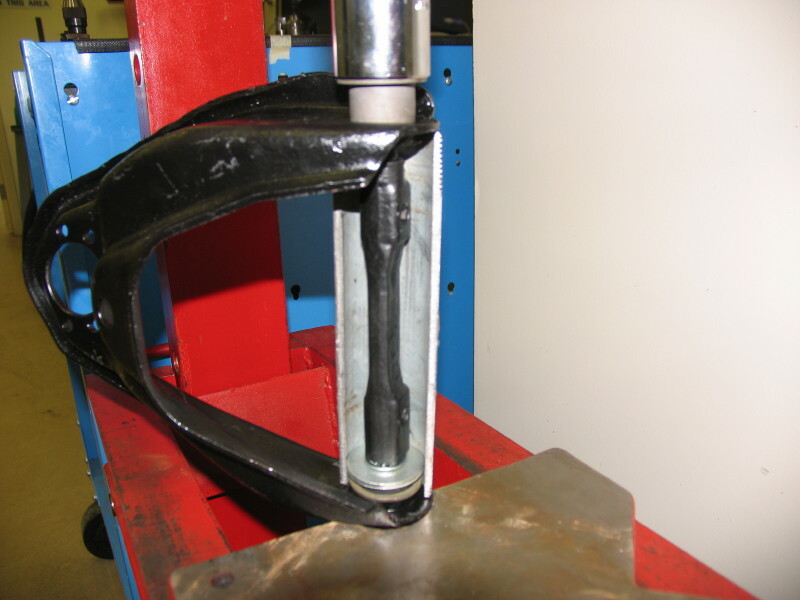 Second photo is of the rearmost bushing being pressed in. 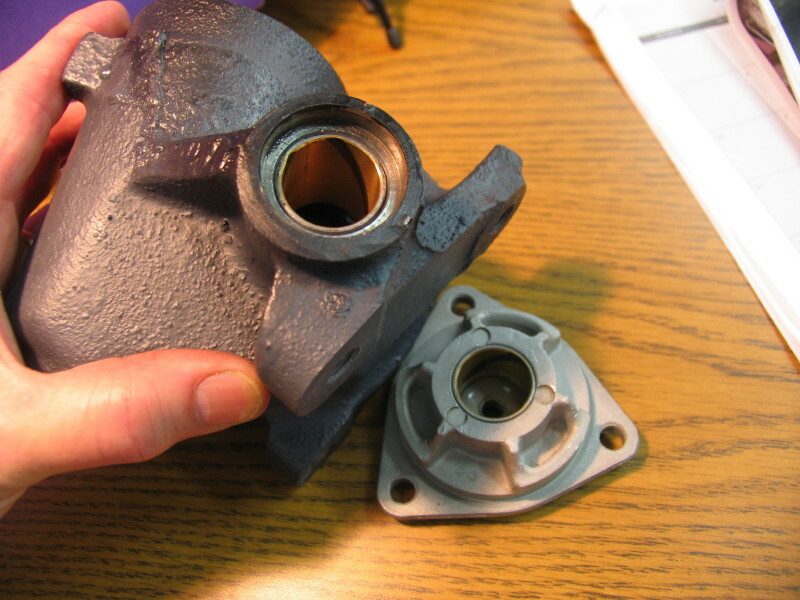 Then, a photo of the front bushing being pushed in after the washers and shaft were put in place. 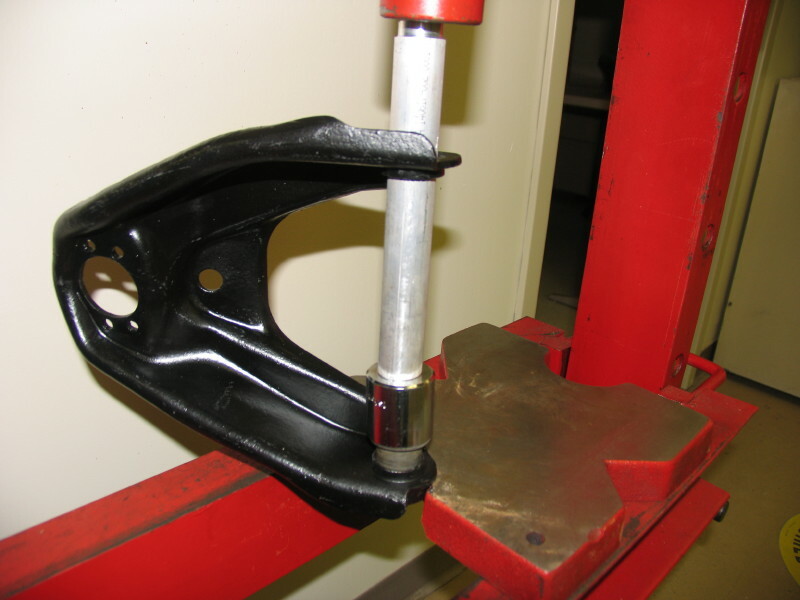 The threaded pipe spans the A-arm to keep the press from crushing the arm when you press the busings in. Pipe is from HD and I cut it lengthwise, then cut it to the proper length. You also use it when pressing the bearings out, and should use something similar (though much shorter) on the lower arms. DAMHIK. Photo in next post is of the finished arm and the pipe I used. Edited 1 time(s). Last edit at 04/15/2011 01:50PM by Mark M.
Sure is nice working with clean parts. Got the seams on my welded in trunk bottom sealed with seam sealer. Repainted the fuel tank and it is ready to go back in, just have to connect all the lines. Didn't like the color it was the first time. New cage nuts are in and idler arm bracket is back on with new hardware. Lower and upper arms are mounted, just not yet tightened down. Kept looking for torque values, only to decide there are none. Did find the torque values for the bolts in the ends of the upper a-arm shafts. Suspension bumpers are on. Got the last few pieces Por-15d. Bought inner and outer tie rod ends to replace two bad ones. Cleaned up the good old ones and found something not right with the old inner that I intended to use - see photo. It is obviously longer than the new part. You can barely see it in the photo, but at one time someone screwed it into a tie rod so far that it left thread marks on the center section where there are no threads. Something tells me this is not a Vair tie rod end. Think I will order another new one. Put the new seals in the steering box. Edited 1 time(s). Last edit at 04/16/2011 06:13PM by Mark M.
Honed out the longer of the two bushings in the steering box so that the pitman shaft fit in correctly. The smaller bushing on the other end fit the shaft just fine. Had plenty of time, so I grabbed Polymer's "Taming the Wild" steering article and tackled the clean up of the worm gear and bearings. Nothing to it - if you have the article, that is (you can see it in the photo.) First time I reassembled it I had two bearings fall out the forward end of the gear and couldn't figure out why. I knew they shouldn't be coming out at all! Realized that when you put the first few back in the top of the gear, the shaft and gear are not meshing well so some of the bearings may work their way out. Pulled the guide on that end off and put the bearings back in and all is well (last photo). Total time for both jobs was less than an hour, easy. As soon as someone answers my tie-rod end post I will be good to go. Edit: In case you counted. Yes, there is one ball missing - it is under the gear. Edited 1 time(s). Last edit at 04/19/2011 11:39AM by Mark M.
Found the lube I intend to use for the steering box. Because his rebuilding advice has been right on I was going to follow texasyenkodudes formula and mix some grease with STP. But, I found Valvoline Synthetic grease at Autozone so I just picked it up. It is rated EP for Extreme Pressure, is a #2 and rated -10F to 385F. Should be fine. Got the steering box assembled, bench adjusted and installed. With no drag on the box from the suspension you can definitely feel the high point when young turn the wheel from one end of travel to another. Does not bind, but gets tighter. I think I will recheck the adjustments now that it is in the car, just to be safe. Readjusted the steering box and it is much smoother. I wasn't far off on the adjustment the first time, but it is much smoother now. You can feel the high point, but the wheel turns past it with little effort. Put the pitman arm back on. Manual calls for 80 - 105 ft. lbs. torque and my wrench goes only to 75, so I went a little tighter with a socket and my breaker bar. Fuel tank is back in place and connected. You can also see the new trunk bottom in the photo. Steering box needs to be wiped clean. Does this look correct? Put the new control rod bushing set on last night, with new nuts and using the old washers that were still in good condition. Somehow, the size of the washer just does not look correct with the shape of the bushing. Also, how tight should I go on the nuts? I cannot find a torque value anywhere in the shop manual. Do I tighten until the bushings flatten out to the size of the washers? Nevermind, just found it in the assembly manual - gotta' get that out more oftern. It's 50 - 70 lbs. 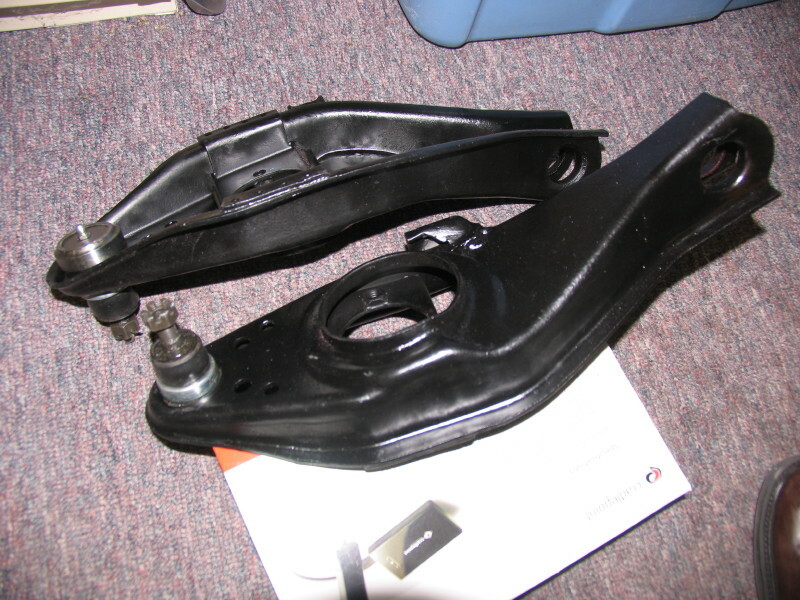 ft. for the rear nut, with an optional 70 - 90 on the front (as if I had the type of torque wrench to get on that one). Maybe it will look correct when I torque it down. Nuts went on pretty tight, using a 16" Crescent wrench, but moved much easier where I put the recommended anti-seeze. Guess that does not effect how well they stay in place. Edited 1 time(s). Last edit at 04/28/2011 07:34AM by Mark M.
Both uppper A-arms and lower arms are on, with upper shaft bolts properly torqued. 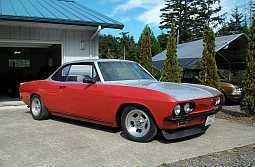 I know to wait on torque of upper and lower bushings until weight is on the suspension. Ball joints are all in, bumpers on, control rods partially on and I got one spring started back in. 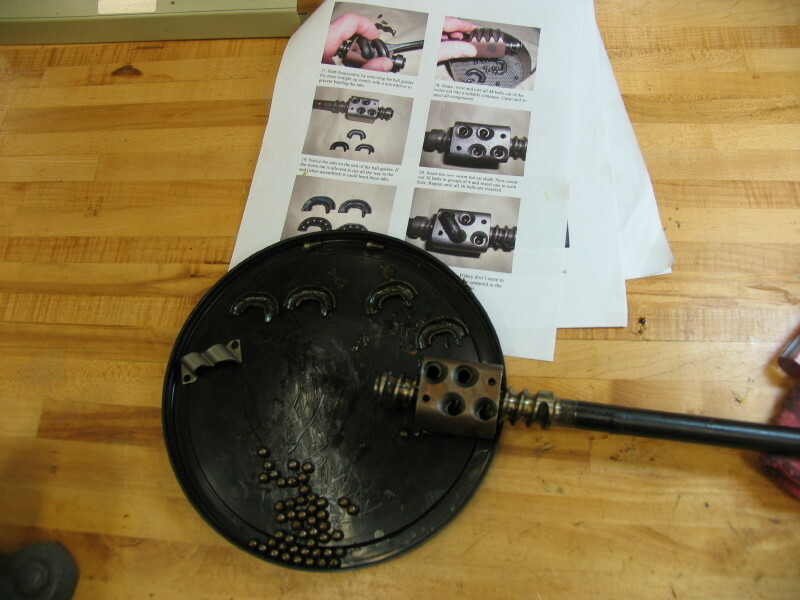 Photos are of the threaded rod used to compress the spring (a tip from CCF). I cut a piece of steel for the bottom, but just needed washers for the top end.